The holiday season is supposed to be a season of reconnection, closeness, and love — but is it usually that way for your family? You have the choice this upcoming season to choose peace, relaxation, and simplicity, and there are resources that can help. 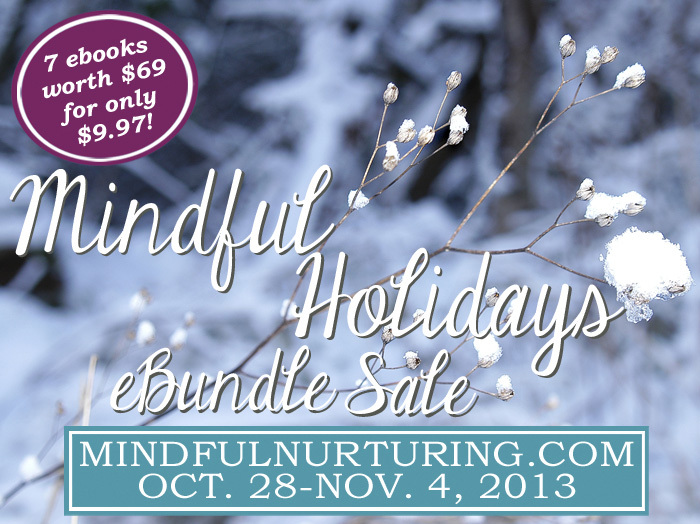 We’re pleased to bring you the Mindful Holidays eBundle Sale, organized by our affiliate partner Mindful Nurturing, in collaboration with the Nourished Living Network. These 7 eProducts will inspire a peaceful holiday, including simple homemade decorating and gift ideas, 3-month access to a virtual yoga class, tips for cooking with kids, holiday recipes, and more. Total retail value is $69.09, and this sale is available only from October 28 to November 4. In Pioneering Today — A Homemade Christmas, author Melissa K. Norris, shares how to get back to the true meaning of Christmas, tips for homemade baked goods when you’re stretched for time, homemade affordable gifts people will use and like, and how to give the gift of yourself to your loved ones with special planned activities. With over 36 recipes, homemade gift ideas, and decor inspiration, you’ll experience a simple Christmas with the joy the season was intended to have. Melissa K. Norris creates new traditions from old-time customs, preserving a lost heritage for her readers. Melissa is a newspaper columnist, award-winning blogger, and radio show host. She teaches traditional bread-making classes, canning, and heirloom gardening workshops. When she’s not writing, Melissa can be found digging in the garden, playing with flour and sugar, and inspiring her pioneer roots. 21 fabulous recipes that can be made into gifts, lunch box snacks, or treats for guests. They are dairy free, gluten free, and mostly sugar free too, and are easy for adults and children to make using common, healthy, lovely ingredients. Luschka lives in England with her husband and two daughters. She has been on a real food journey since her first child was born, and loves trying new recipes and flavours. She recently started a food blog, Keeperofthekitchen.com, where she shares the recipes she uses to fill her kids lunch boxes – normally healthy, always tasty, good-for-you snacks. This is a Christian-based 25-day family Christmas devotional. It’s designed to help your family focus on the real reason for Christmas — the birth of Christ. It is full of family time activities as well as a parent section to understand the history and theological significance of each day. Have the holidays ever made you feel more stressed than blessed? Expectations and pressure to create the perfect holiday can lead us down a path toward burnout. Author Marie James, who has been there and learned how to restore the joy, shares ten keys to planning more relaxing and enjoyable holiday seasons. Marie James and her husband Jim live on a Pacific Northwest farm they share with their extended family. A freelance writer and editor, Marie blogs at The Homesteader School. She can be reached at Marie@HomesteaderSchool.com. Chara uses her sense of humor and practical experience as a teacher and mother of 3 to help you and your family succeed with real food cooking. Whether you are a gourmet cook or just learning, you will find practical ideas and suggestions for how to get your kids cooking, culturing, cleaning, and celebrating their time in the kitchen! You can find the new ebook “Adventures With Kids! In the Kitchen” and Chara with her adventures on Facebook, Twitter, and Pinterest. Chara at Stitching Hearts Together is a busy (she says “That word seems so cliché — maybe dizzy is better”) wife and homeschooling mom to 3 healthy, happy (most of the time) children. A teacher by trade, Chara has always been passionate about educating people — about real food, simple living, the importance of playing in the dirt, and a variety of other topics. This virtual yoga series from Stay-at-Home Yoga has five, full-length classes accessible whenever and wherever you roll out your mat. You will get three months of unlimited access to this series, designed to help you release tension, increase strength, and cultivate joy this holiday season. Jennifer Hoffman is not your average yogi. A public accountant turned certified yoga instructor, Jen now balances an active practice with her busy life as a yoga teacher, blogger, mother, and wife. The key to this balance is simple: Jen lives life with intention. She teaches virtual yoga classes at StayAtHomeYoga.com. At EveryBreathITake.com, she encourages her readers to live with intention, writing with a heart for whole and healthy lives on parenting, faith, relationships, and, of course, yoga. She is also the host of the Intentional Chatter Podcast. She relies on her husband Derek to keep their two lovely children — and two furry Labradors — off camera through Namaste. Approaching a personal herbal practice, herbalism basics and safety information. This book is the perfect step in the right direction for anyone considering using herbs, essential oils, or flower essences in their own life for health and wellness. It discusses how to approach a personal herbal practice with joy and gratitude, the basics of herbalism, and important safety considerations. Natural Herbal Living is written by several experienced practicing herbalists who have a passion not only for herbs, but for sharing their vast and extensive knowledge as well. They have many different specialties giving every issue a depth that you won’t find in most herbal texts. You can learn more about our amazing authors here. Get your bundle today and save close to $60! These products will never be sold together at this price again!